I’m always looking for a good non-mayo based salad to entertain with year round, but especially in the summer. A few month back I co-hosted my best friends bridal shower. One of my tasks was to coordinate our lunch. Even though I was traveling 3 hours north I still planned to cook quite a bit. A week prior to the shower a coworker of mine shared the most amazing pesto tortellini salad with me. It was full of flavors, fresh, and at that moment I instantly knew it was going to replace the tried and true pasta salad I regularly make. He had created the recipe and I then adapted the recipe to the brides liking. Since my friend created the recipe he never wrote it down–not intending to share the recipe with anyone. So we talked about the ingredients he used, and then I went to work on measurements and what not. The pasta salad was a huge hit at my best friends bridal shower, and I will definitely be making this pesto based salad (no mayonnaise people–perfect for summer time picnics) over and over again this summer and year round! Speaking about summer… Maggie from Midwestern Girl DIY and Kristin from A Simply Klassic Home are hosting a Ready 4 Summer Blog Party this week! If you have a great summer recipe you’d like to share make sure you got to Maggie and Kristin’s blogs and link up your favorite recipe. I am contributing this super simple and healthy salad for their blog party! Make sure you go check out The Gunny Sack to see what dish she is bringing to the party! In a large pot boil water and cook tortellini according to directions. During the last 30 seconds of cooking add the spinach and wilt. Drain the pasta and spinach and place in a large bowl. In a small saute pan toast the pine nuts until they are golden brown then set to the side. In the large bowl with the tortellini and spinach add the pesto, sun dried tomatoes, artichoke hearts, toasted pine nuts, and grated parmesan cheese. Mix well until incorporated. Refrigerate for at least 2 hours and serve cold. It sounds delicious Katie and the pictures are stunning as usual. Have a good week! Thanks Carrie! I actually rephotographed this pasta dish because I wasn’t happy with my first set of photos! lol. Thanks for having me Maggie! This looks so good, Katie!!! I love pasta salads and I love that you added pesto to this one! 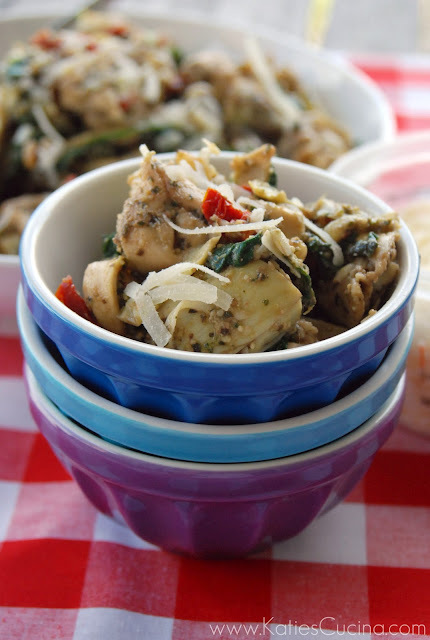 Thanks–it is great and a lovely spin on the classic pasta salad! Lol you crack me up… “mayo-soaked pasta salad is so 90’s”! LOVE IT! Oh my goodness, this is fantastic. I am a huge pasta lover. Thanks for sharing with the newbie party and the summer party. Looks delicious! I’ll have to give this a try. This sounds amazing! I love pesto sauce and I love tortellini! Thanks April–now you know where that “table cloth” came from–the Walmart fabric clearance area! This looks so delicious and it seems easy enough to make! Thanks for sharing. Gina–thank you so much for the feature. I just saw this delicious looking thing on Random Thoughts and made a beeline over here to see this blog and get this recipe. YUM. YUM. Thanks for stopping by Debbie. I hope you’ll join me on my culinary adventures! Sonja, thank you for taking the time to leave a comment. I’m so glad you enjoyed this salad!